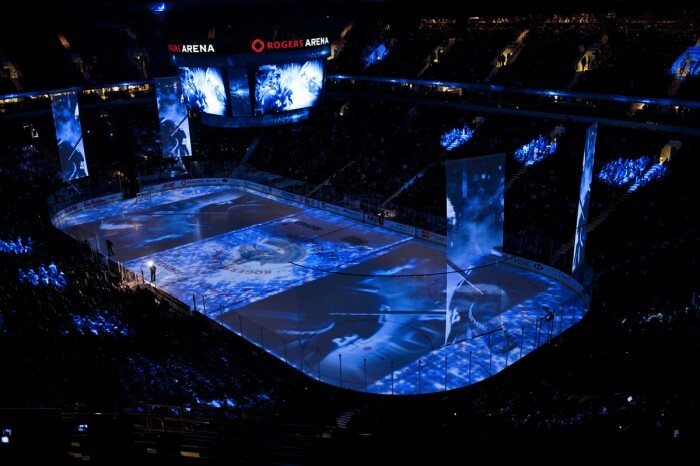 Established in 1970, the Vancouver Canucks now call the 475,000 square foot Rogers Arena home. Already well-respected as the official ice hockey venue during the 2010 Winter Olympic Games, the Canucks brand and creative team wanted to set a new, and largely unchartered, direction for the venue. Led by creative director Mark Raham, the Canucks contacted Epic Production Technologies to discuss large-scale imagery solutions for the venue. 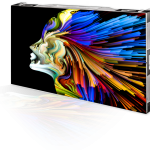 Given the numerous installation details to consider, as well as the large surface area that needed to be illuminated, Larry Darling, VP of Sales for Epic Production Technologies, suggested Digital Projection International’s (DPI) high-brightness projectors. 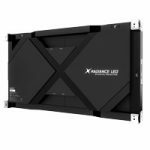 After initially selecting lower lumen displays, four 30,000 lumen LIGHTNING 45 sx+ displays were eventually chosen. The Canucks couldn’t be more pleased, as Raham remarked, “We’re so glad we went with the higher lumen displays because they have so much visual punch. We’re discovering new ways to use them every time we work with them.” The LIGHTNING displays are used in conjunction with Hippotizer servers and a Datapath X4 processor to project a blended and mapped 200’ x 80’ image on the ice. To add dimension and scale, the ice projections are complemented by four hanging scrims, reaching four storeys in height, creating a vertical projection surface above each corner of the ice surface. With such powerful displays in their creative arsenal, the Canucks production team are regularly discovering new ways to, as Raham describes, “make the venue itself an all-encompassing, immersive experience.” To date, attendees will experience an approximately 10-12 minute custom-created pre-game ceremony, including imagery shown during national anthems. Additionally, at key moments in the game when action on the ice has paused, the displays reveal imagery mapped to specific surface details on the ice, such as boundary lines and logos. A massive light show occurs at the end of each intermission, enlisting the projectors to elevate the intensity level of the crowd with rock-concert styled effects. A final application includes the three stars presentation at the end of the game, with custom graphics accentuating the awards ceremony.